The Empower Good Podcast is a weekly show designed to empower your personal influence for good. Each week, Joel Moutray, the host, will be interviewing guests who are mastering the art of influence and are taking their talents public so they can do more good! Why Ostap Dzyndra Quit His Job!!! Loosing your job is one thing, but quitting your job is a whole other ballgame. That is exactly what Ostap Dzyndra did. He did not however to make a fortune like most entrepreneurs do. His story is touching and what he is now doing will for sure inspire you! Listen to find out! A couple weeks ago I had the privilege of hanging out with @trevorktyson. His story of overcoming anxiety and depression is motivating beyond belief! @ashkatch is such a beautiful human! She has helped inspire me to where I'm at in so many ways! This episode will definitely help you be empowered to help others by turning your passion into a calling. Enjoy! In this weeks Audio Blog I break down share the REAL why of why I'm podcasting! If you want to do good, but are not sure where to start, or what to do, LISTEN to this one! At the end I break it all down! (LIVE) Isaac Weins: Helping Veterans Through Junk Removal! @isaacweins is definitely an awesome human! He's only 25 years old, but still owns his own business that not only directly impacts the environment for good, but also helps veterans get back on their feet after they get back from deployment! I know you will be inspired! Also, check out @cheapseatssociety for more information on an awesome sustainable living event happening Aug 25 in LA. A-VLOG: Don't Miss This Episode!!!!!!!! Seriously! I know many of you are struggling with different things! Im no different! In this episode I open up and get real vulnerable about some recent ups and downs I've had. I promise you it will touch your heart! 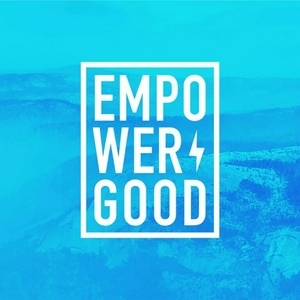 Audio Vlog: The Empower Good Story! Stoked about this weeks episode! Recently I was featured on the Sound Matters Podcast With Tom Leu where he interviewed me! Here is the replay from his show. Enjoy! Whats cool about Adrian Vasques' story is that he didn't move from California to NYC for his own success and happiness, but instead so that he can support his family! By the end of this podcast you will be inspired to not only self educate and embrace the process, but also to strive to act on your dreams in order to impact more people for good! This episode is literally one of my best edits yet! In addition, my guest Gabriel Desanti brings so much insight and expertise in the areas of photography and videography. He seriously practices what he preaches, and sets the standard high. Finally, he shares game changing advice to grow your social media following! ENJOY! A couple weeks ago I was able to meet Job Johnston in person! We had been good internet friends for a while, but had never met! Such a privilege to be able to pick his brain on topics from overcoming fear, photography, Instagram feeds, and how to do quality work! Enjoy! This episode is VERY practical! I talk to Andrew Lermsider, a thoroughly successful online marketer, with over $600 million in online sales revenue under his belt. He not only breaks down how to keep your customer long term, but also how to optimize your user experience. In this episode Joel has the funniest interview of the entire show with Todd Frazier from the DO THINGS Podcast. Todd, a high energy entrepreneur, shares his inspiring story on how he grew, not only his business, but also his podcast, to reach a ton of people. Kick back, laugh and gain tons of valuable information ranging from podcasting, YouTube, making t-shirts with Printful.com and much more! In this episode, Joel has an inspiring impromptu interview with Michael O'Brian: a self published author from New Jersey. After a nearly fatal cycling accident, Michael decided to change his life around. Instead of chasing happiness in the rat race of life, he was now going to do everything he could to help others. This episode will not only give you motivation to be positive, but will also give you practical tips on how to share your passion with the world. In this exciting episode, Joel himself gets put on the hot seat as Chris Dell, his guest, gives Empower Good some personal advice. In addition to that, they chat about how technology has changed the game, making it possible for literally ANYONE to become a content creator and publisher. Finally, they dig into some details on how the app anchor.fm is democratizing podcasting. In this episode my guest Tom Leu brings so much value that it’s not even funny! He shares loads of inspiring lessons from years of experience in the fields of psychology, music, photography, radio, podcasting and much more! Don’t miss the ending, cuz Tom shares a secret that even Empower Good is starting to implement. In this powerful episode, Mikhail Alfon, a digital marketing entrepreneur, talks to Joel about the impact that gratitude has had his life. He not only delves into the ‘why’ behind what he does, but also gives very practical advice on how to build a personal brand online. After listening to this episode, you’ll be empowered to think of the social media platforms as tools rather than just a place to just grow a following. In this heart-warming episode, Joel talks to RG Enriquez from Astig Vegan, which is a blog, and YouTube cooking show. RG's mission is to veganize Filipino food and show that it is possible to eat healthy while at the same time not compromising culture. You will not only be empowered by the life changing impact she has had on her followers, but also by the practical tips she shares on monetization, content distribution, and growing your online influencer. In this awesome episode, Joel talks to Lainey Liz, a full-time YouTuber, with a baking channel (Simply Bakings) with over 260,000 subscribers. She not only shares shares practical advice for aspiring creatives but also breaks down the story of how she now makes a living making videos full time. After listening to this interview, you’ll be inspired to share your talents with others no matter your personality or background. In this episode, Joel reconnects with a good buddy from college, Justin Khoe. Justin is currently the host of a YouTube channel called That Christian Vlogger, with 48,000 subscribers, where he posts thought provoking videos to stimulate dialogue with young people. After listening to this interview, you will not only be encouraged to be intentional about growing your personal influence, but also have the practical tools to do so. In this episode Joel has an insightful discussion with Dr. David DeRose, a naturopathic doctor with over 30 years of experience. Dr. DeRose not only shares how digital media has boosted his ability to help others, but also brings to light the dangers of neglecting your own personal health on the altar of success. For anyone seeking to make a radical difference in this world, this episode will be a strong wake-up call to be proactive about your personal health. In this powerful episode, Joel is joined by Desiree Heckman, a wife, mom, yogi, and entrepreneur. The theme that keeps popping up throughout the conversation is the importance of really loving people! Desi also shares insightful tips on time management, self improvement and work life balance. In the end you’ll be motivated to be intentional about personal growth so you can be more equipped to help others! In this episode, Joel is joined by Summer Silvery, a passionate doodle artist from LA. You’ll hear how she got the attention of celebrities like Logan Paul, Gary Vaynerchuk, and The Rock, as well as other inspiring experiences that will empower you to be intentional about making a difference. Joel Moutray: The why of the EGP!